"At Cheltenham Racecourse and saw the fantastic display this morning. Congratulations to all in your team and in this commemoration. Remembering all those who flew and worked on the original planes." "There has been plenty going on at Cheltenham racecourse today to commemorate 100 years since the ending of World War I. Perhaps the reality of war was really brought home to the Cheltenham crowd with the Aerial Combat Display, which took place above the racecourse in the natural amphitheatre created at Prestbury Park. Seven planes from the Great War Aerial Display team re-enacted a World War I dogfight, chasing each other through the sky for 12 minutes above the course. The fight became more real with the use of pyrotechnics mimicking gunfire, and with smoke trailing from the aircraft as they nose-dived towards the ground. The planes, all in private ownership, included a Sopwith Triplane, a German Fokker Dr1 Triplane and Junkers CL1, a Royal Aircraft Factory BE2c and a SE5a. At the end of the 12 minutes, the planes disappeared safely over Cleeve Hill back to base, leaving behind a crowd of racegoers reflecting on the immense bravery of those World War I pilots." "Huge thanks for the magnificent fly past. A wonderful addition to the Remembrance Day Service this year and much appreciated. " "If you haven't seen the Bremont Great War Display Team, go a long way out of your way to do so. Eight replicas, including Sopwith Tripe, BE2c, SE5a, Avro 504 Junkers CL1 and Fokker Dreidekker, all shooting the bejesus out of each other while manoeuvring within the confines of the aaerodrome amid much pyrotechnic shock and awe." "There could be a more appropriate starting point for the Aerial Pageant than the Bremont Great War Display Team who brought to life the very origins of the Royal Air Force. Their display is always a spectacle, but it's so very much more impressive in an intimate setting like Rendcombe. Their swirling dogfights and supporting pyrotechnics really grabbed the attention of the guests who were enthralled." "Next came a very entertaining demonstration by part of the Great Warbirds Display team that fly scale replicas of World War One aircraft. The German Army Air Service was represented by two colourful JG-1/Jasta 6 Fokker Dr.1 Triplane replicas: 403/17 of Lt. Johann Janzen and 556/17 of Lt. Ludwig “Lutz” Beckmann. The opposition in the aerial dogfighting came in the form of a Sopwith Triplane that represents N500, the first Triplane prototype flown by A Flight, No. 1 Squadron of the Royal Naval Air Service alongside Royal Aircraft Factory SE5a B595 of No. 56 Squadron, flown during WWI by Lt. M. E. Mealing, MC. Last, but certainly not least, came a replica Royal Aircraft Factory BE2c, a fragile, early-war biplane which the Royal Flying Corps initially fielded in the artillery observation role, but later relegated to training roles due to its vulnerability to German fighters. This particular aircraft is known locally as the “Biggles Biplane,” because it was built for the film “Biggles Sweeps the Skies” about W.E. Johns fictional WWI hero James Bigglesworth, aka Biggles. The team flies with a great deal of skill, clearly showing how chaotic the skies could be above the trenches in World War One, with planes engaged in combat crossing over each other and filling the air space with maneuvers coming from all directions." "To everyone involved in the running of the team a Big Thank You. I was present at the Biggin Hill festival of flight last Saturday and thoroughly enjoyed your display, excellent. I have been reading books on the subject of aerial warfare recently and seeing you just brought paragraphs and pages alive in my mind. A great display all that was missing was machine gun chatter. Thank you all again." "Aerial combat from the First World War was also remembered during Saturday's display with the Great War Display Team making their Air Festival debut. The Team flew seven of their aircraft including pairs of RAF SE5as and Fokker Dr1s, a Junkers CL1, an RAF BE2c and the Sopwith Triplane. Their routine of swirling dogfights looked stunning over the amphitheatre of the Bournemouth display area and the blue waters." "Thank you to the team for the fantastic display at Bournemouth. First time I have seen these aircraft. It meant a lot to me as my grandfather Ernest Johnson worked on the manufacture of planes at Boulton and Paul in Norwich during WW1. Fantastic." "Dear Gordon, Thank you all for the great flying display on Saturday at the Bournemouth Air Display. What a beautiful day it was for flying in an open cockpit aircraft. 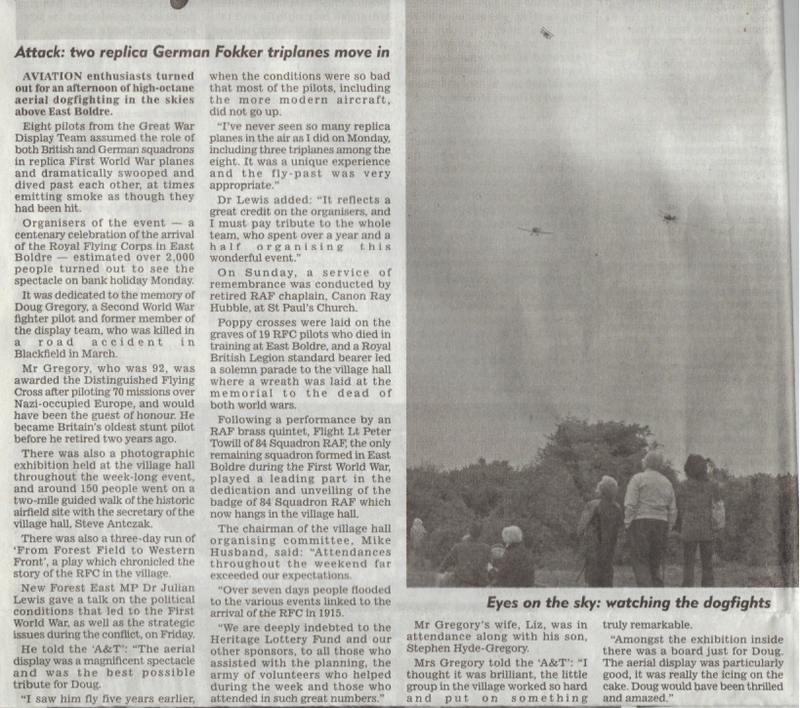 Everyone in the crowd around us on the clifftop enjoyed your display." "Fantastic; that's how I would describe your approach and assistance from the very beginning right to the end. To have an SE5a, albeit a 7/8 scale replica, was outstanding and brought the dedication of those early pilots and maintainers into real contrast. During the earlier dedication service to the plaque now firmly affixed to the church wall we sang a version of "Those Magnificent Men in their Flying Machines" - and then you arrived - maginificent! We are indebted to you and the rest of the GWDT." Brian Canfer, Sqn Ldr Ret'd. A very big “Thank you” to you and your colleague for the spectacular fly-past at our Victoria Cross commemoration event – it was the “icing on the cake” for what had been a very special and a very successful 2 day event in the village. One person who was particularly moved was Keith Brooks, who is the grandson of the Victoria Cross recipient Edward Brooks and who worked closely with us in the build up to the event and was then at the centrepiece of the stone unveiling ceremony. He was always extremely hopeful that the flypast could and would take place and when it eventually did, I feel that he felt it was entirely the appropriate recognition and acknowledgement of his grandfather. Thank you again for such a superb event – as you say, it was a pity that the CAA somewhat curtailed the extent of it – and please would you pass our thanks and appreciation on to your colleague and co-pilot. Just a few words to say thank you for allowing myself and my Royal Flying Corps chums access to your fabulous airplanes over at the Flywheel Festival over the weekend. It was lovely to meet up with yourself and your chaps and to see you putting your planes through their paces. Without doubt one of the best flying displays I've ever seen. Just marvellous! Judging by the reaction of the crowds around us, they just loved it. I think the pyrotechnics added to the spectacle enormously. Unfortunately for RAF Cosford this year, despite the clashes with other major European events and the subsequent difficulties in re-capturing the magic of 2015, the show's main problem was, as had been anticipated the entire week prior, the Great British summer time. Low cloud rolling in almost as soon as the flying display was due to start prevented nearly all acts from flying their full displays and as mentioned, rain and wind elsewhere prevented several other aircraft from even reaching the venue. Credit must go however to the Great War Display Team, who utilised Cosford's intimate crowd line to showcase their exceptional set piece display - one of the few acts of the day able to fly to their full potential, undeterred by less than ideal conditions. 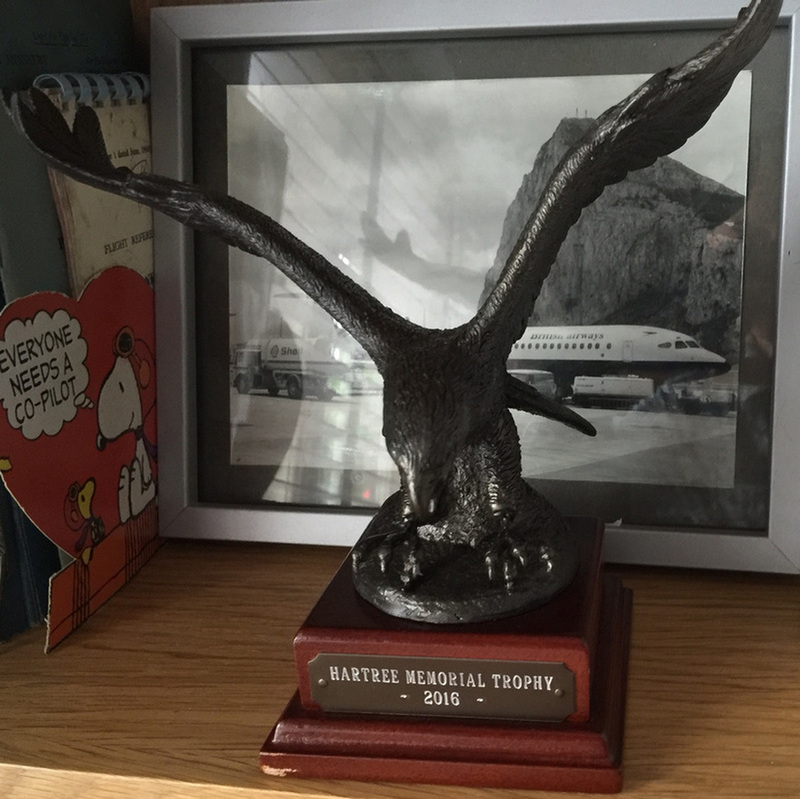 New for 2016, the team utilised pyrotechnics as part of their display and with their very marginal aircraft battling against the weather, their display at the show was awarded the 'Hartree Memorial Trophy' for best flying display. I'd never even heard of your Display Team until yesterday at RAF Cosford and, for my money, you guys were the Stars of the Show. Brilliant display. Superbly choreographed. Many, many thanks for a delightful experience. In their Cosford review, www.air-shows.org.uk said "The 100th anniversary of the Battle of the Somme was remembered by a fantastic display by the Great War Display Team. As ever the Team recreated the swirling dogfights of the First World War with eight aircraft. However for many of their displays this year they have enhanced their display with some pyrotechnics recreating flak guns and bombs which creates a really eye-catching re-enactment." "With the steady stream of imported and restored types, we mustn’t forget the vital role played by the Great War Display Team in telling the story of early air combat. The team has gone from strength to strength in recent years with new aircraft and pilots joining the mix, and annual tweaks made to the format of their heavily choreographed routine to keep the whole thing fresh. They are one of the UK’s finest display acts, and with more aircraft due to swell their already considerable numbers in due course, their future seems very bright indeed." Hope you are well and thank you again for some excellent displays at Flywheel 2015. Might the GWDT be able to display again for us on both days next year, complete with pyros? It would be terrific to have you all back again if possible. Thanks so much for all of your efforts. Two great shows and very popular. Good Pyros too which adds a lot. Can’t promise Catalina crew transport every time, but it seemed a good call in view of anticipated traffic Sunday morning! Great display both days,so very many thanks to all on GWDT and special kisses to Vic. I just wanted to say a huge Thank You for an amazing display at Duxford on Saturday. Whilst you might not have the speed of the Hunter or the awesome power and noise of the Vulcan your display was truely one of the highlights of my day. Watching the mesmerising swirling dogfights to the accompaniment of my son and daughter shouting "get 'im Bruce" at the top of their voices will stay with me for a long time. I also saw you at Sonisphere earlier in the year but the thing that really struck me this time was that this display really drives home that most of these planes that we all enjoy watching are actually machines of war and a hundred years ago (or much less in the case of many of the other planes displaying) men, or boys even, risked their lives every time they got in the cockpit. Thank you for providing lasting memories and something more than a 'normal' tricks display. Hope to see you perform again next year! We would like to thank you and your team / colleagues for the fantastic aerial display you provided on Saturday. All at our show and probably Romsey were so impressed and awe struck by the display and the added value it provided to our WW1 themed show. Some of our VIP guests at the show included the Military Attachés from the Australian and Canadian High Commissions and the Military Attaché from the American Embassy, along with the Lord-Lieutenant for Hampshire and Lady Brabourne. At the other end of the spectrum to the high-powered World War Two warbirds, the Great War Display Team (GWDT) brought eight aircraft to Shoreham to commemorate the centenary of World War One. I’ve waxed lyrical about the team in earlier airshow reports, and it may be of no surprise to say that I have only positive things to write on this occasion… There’s just so much to enjoy in their routine – the on-crowd break, a new development for the team, was a dynamic way of opening their display in style and breaking down the various elements into pairs, whilst the higher level elements wheeling to and fro, combined with the lower level opposition passes from pairs of dogfighting aircraft, give the impression of frenetic Great War combat. The choreography is just superb, with constant movement and action in front of the crowd at different altitudes and on multiple display lines. Commentator Stephen Slater, owner of the BE2c replica flown by Matthew Boddington, is another fine addition to the team, his intimate knowledge of the era and the aircraft involved providing both context and poignant insight into the perils of early of air-to-air combat. Over the next four years, the GWDT’s role in reminding this generation of the terrible losses of World War One will position them amongst the most important ‘acts’ out there. The Great War Display Team were back at Shoreham, their triplanes, biplanes and monoplane twisting in mock battle against the Sussex countryside. The planes are all replicas, of course, but the Sopwith Triplane, two RAF SE5as and Matthew Boddington and Steve Slater’s recently restored RAF BE2c, looked totally convincing fighting off the Fokker Dr1 Triplane and Junkers CL1. The GWDT routine is arranged to ensure there is always action a high and low levels all over the airfield and taking advantage of the scenic natural and built landscape. The display was phenomenal as always and a fitting tribute to Shoreham favourite John Day, so tragically killed whilst rehearsing for this airshow season. Elliott Marsh, who has been known to attend an odd airshow or three, wrote some kind words which I hope he doesn't mind me repeating. "Top day at Dunsfold in the sun (for the most part!). The Lancasters were sublime, the OFMC pair and solos tremendous (AK and Jones, you animals), the Canberra was as good as I've seen it since its return, the Vulcan impressed with some nice howls and the Great War Team stole the show, for me - a superb 9-ship display." The Great War Display Team took the Dunsfold audience further back in time. They had their full nine-ship on display with pairs of Fokker Dr1 Triplanes and Junkers CL1 mixing it up with a trio of RAF SE5as, Matthew Boddington's RAF BE2c and the Sopwith Triplane (another Brooklands linked type). The team proved to be one of the highlights of the display filling the sky with their unique recreation of the First World War's deadly skies. globalaviationresource.com airshow-review Elliott marsh again. Looking at our future events, are you taking bookings for 2016? We have an event to mark the centenary of the tank on Saturday 17th September 2016 and would like to book the Great War Air Display Team for a similar display to yesterday. All the comments I heard about your display from the public where very complimentary. Very well flown by the team in bumpy conditions. It all looked great from the ATC van. Well done for being on time as there was very little space for error with all the events taking place on the ground. Film crew were very professional with multiple cameras and I am sure they got some good footage. Commentary by Terence was also very good. Just the right amount of info. Suffice to say that this was a very successful day for us (well over 2,500 people attended) and many people have already said how much they enjoyed it, particularly the impressive flying display by Gordon and the three other pilots. The BE2c looked stunning (this being the first time I had seen it) and all four machines gave a good performance despite the windy conditions. The display certainly worked well here operationally and I am sure that we would like to book you all again next year perhaps with several more aeroplanes too. Thank you for the spectacular show from the Great War Aircraft Team that you and your colleagues conducted at the RAF Henlow Families Day on 30th July 2014. It was good to view aircraft that may have once flown from RAF Henlow and I'm sure that the Staff and families at the Station can now begin to appreciate the value of this Airfield and, thanks to your aircraft, some of its historic connections. It never ceases to amaze me, your pilots' skills, daring and entertainment value. I have seen your practice routines and rehearsals a few times but I was truly impressed with the overall flying skills and professionalism. I realise that there is a significant team behind each aircraft sortie and, as well as the Pilots, thanks to those who may have given of their time to make this happen. Once again, RAF Henlow played host to crowd pleasing and nimble biplanes and triplanes manoeuvring around the sky. Again, thank you for your energy, commitment and timing. The First World War was marked with an appearance by the Great War Display Team with all nine of their aircraft. They operated from White Waltham as Farnborough only has hard runways which are not suitable for the team to operate their delicate machines from. Their line-up including Bruce Dickenson from Iron Maiden flying one of the Fokker Dr1 Triplanes and they gave a superb account of the swirling dogfights of the Second World War filling the sky. Their participation at a Farnborough event is particularly apt as the aerodrome was home to the Royal Aircraft Factory that produced the BE2c and SE5a aircraft. "Great War Display Team win best display of the day. It was a beautiful set-piece with 9 aircraft in the air all at once. Brilliant." by Flare Path. Cosford also had a wide range of historic types in the display. The 100th Anniversary of the First World War was marked by the Great War Display Team flying nine of their replica aircraft. The RAF BE2c, Sopwith Triplaneand three RAF SE5a wheeled around the sky with pairs of Junkers CL1s andFokker Triplanes recreating the battles over Europe between 1914-1918 which fills the sky and captivates the audience. Another historic commemorative act in the flying display was the Great War Display Team, marking 100 years since the outbreak of the First World War. The Great War Display Team are always good value and having nine replica WWI aircraft in the sky at once makes for an interesting demonstration, with tail chases a plenty. One of the more informative commentaries by Stephen Slater accompanied the aerial action. Sonisphere 2014 Bruce Dickinson to fly his Fokker Dr1 as part of an air display before the show. Iron Maiden singer Bruce Dickinson chats to Steve Beebee about his new aeronautical passion – flying a Fokker Dr.I with the Great War Display Team.